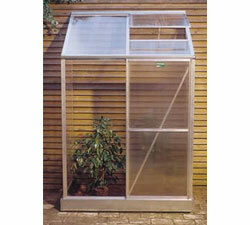 These small, lean-to greenhouses offer many of the same features as the larger Juliana greenhouses. They are designed for customers with limited garden space, who want to grow only a few plants or carry some plants through the winter. Width: (mini 2)4'3" , (mini3)6'3"